This iconic angling book has been launched today and this provides the perfect opportunity to post my book-related blog. In a nutshell, the book content is contained succinctly within the title and has been written by carp Historian and author ‘Chris Ball’. 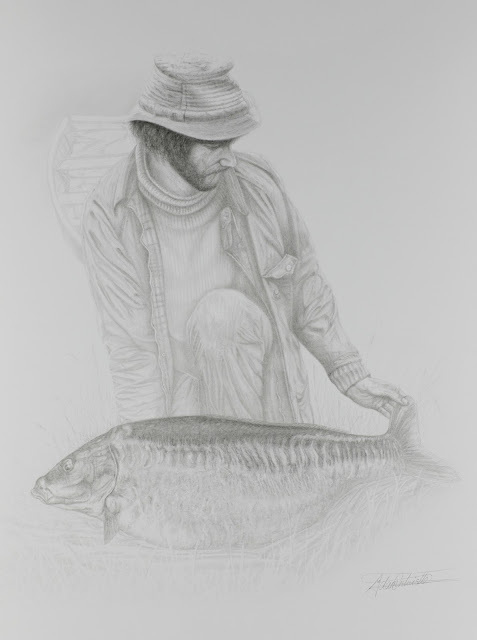 This piece of writing has been discussed in closed circles for sometime now, and anybody closely involved within the carp fishing scene over the last 40+ years will know full well how hard this gentleman has worked to quietly compile some of the most important moments of our privileged pastime in pictorial form. Chris has diligently harvested an enormous historical portfolio, ranging from tackle items, pictures, artwork and important documents and letters from all the known carp fishing greats from past and present. I have attached a small excerpt below from the man himself; this will provide you with a small glimmer of his incredible passion and an understanding of how this seed germinated as a young secondary schoolboy - magical reading indeed. On the eve of the ‘Historical Carp Waters’ book being published, here is a little background on how and why I fell in love with all things carp. As a wide-eyed youngster just into my teens marked the start of collecting pictures and stories about carp. In 1959 I was thrilled to catch, by design, some carp on floating crust - long lean wildie-type commons of 2lb-3lb. Carp and fishing for them soon occupied my every thought and when a couple of years later I banked a 10lb 4oz mirror from The Tarn Pond at Cutt Mill, Surrey, everything went into overdrive - it’s never abated since. As a measure of how smitten I was with carp, during 1960 (my last full year at school) I embarked along with the rest of my class on a task to make a handy scrapbook which included, hessian covered front and back covers, marbled end papers and sporting around 20 blank pages ready for items of interest to be stuck in. Nearly every kid in my class had football players or racing cars, steam engines, etc. filling the pages. But me...? my scrapbook was full of carp reports from Angling Times during 1960. This scrapbook survives to this day and is one of my most cherished angling possessions. From around 1970 onward I was lucky to meet and talk with the likes of great anglers such as Richard Walker, Peter Thomas, Maurice Ingham, ‘BB’, Bernard Venables, Fred J. Taylor, Dave Steuart, Jack Hilton, Bill Quinlan, Tom Mintram, Bruce Ashby, Mike Harris and many others which only served to heighten the grip carp fishing already had on me. To sit down face to face with these men and talk about their carp fishing experiences later fuelled the desire to write about these successes and of course obtain as many pictures as possible of their catches. I remember at the time people like Maurice Ingham telling me, “Why are you asking me these questions when you already know the answer?” I replied I simply wanted to hear from him personally the stories I’d only ever read of in books. 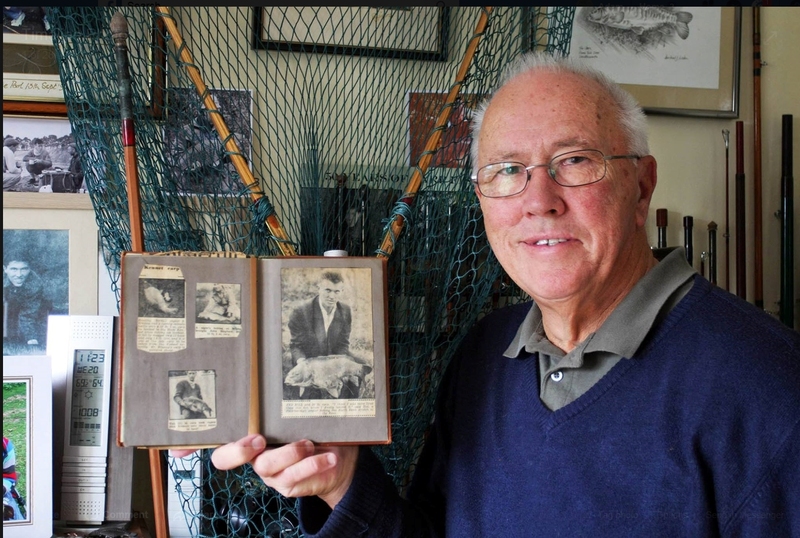 As can be imagined the amount of carp pictures and stories amassed in over 50-years of collecting is vast, the pictures alone run into many thousands with much of it these days scanned and safely stored away. I’ve joked now and then to people that if you were a prominent name in carp fishing during last half century then somewhere I’ll have a record of it. The book contains over 100,000 words, 400 pages and hundreds of photos of which most are from Chris’ own albums and have not been published before. Twenty two different waters are covered within the pages ranging from Redmire to Yeoveney Pits, Ashley Pool to Withy Pool along with all the legends who have fished these waters - in a nutshell its a wealth of historical facts and captivating stories that are a real treat to be shared with the wider public. This book will appeal to carp anglers new and old who possess a strong infinity to our past angling hero’s, combined with waters you may or may not know...but all containing the magic ingredient ‘History’, which offers insight into the foundations of our pastime. It is a lifetime of data collection that will never be repeated again, and for that alone it is essential reading that will take pride of place in your carp fishing library. My role in all this was to hopefully add another dimension to the book with my Artwork. I have been blessed to be involved in this project and big thanks first of all to Wayne Cryer and the faith he had in me. Wayne is publishing the book through ‘The Little Egret Press’. Equally, I am indebted to Chris Ball, without which this project would never have been possible. From both a personal and working perspective, this year has been one of the most hectic I can recall, so my aim was to focus on a select number of drawings to make sure I could realistically reach the deadline. 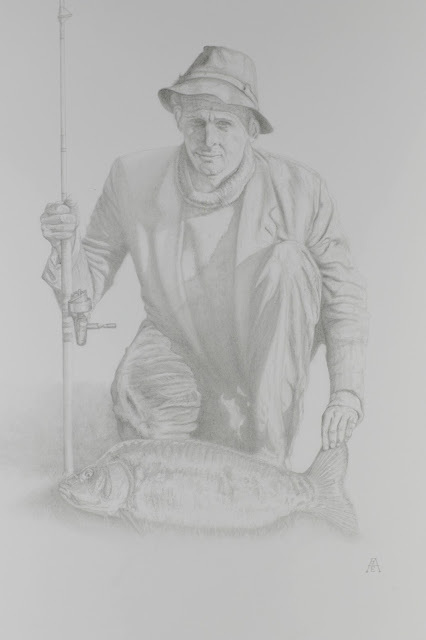 The main drawings are portraits of anglers who played a significant role within the book; some the angling world know and others not so mainstream, but arguably just as important in their own right. The book has been dedicated to Donald Leney, a mighty figure who stocked most of the famous UK waters. This key point becomes evident as you read the book. His fish became known as the ‘Leney strain’, which initially came from Holland and were sold through his fish farm in Surrey around the 1920’s. The actual fish he stocked into Redmire Pool went on to break three British Records, the first being a local angler named Bob Richards in 1951 landing a 31lb 4oz mirror. The following year Richard Walkers’ Common of 44lb in September 1952, then to fall once again with another ‘Leney’ to Chris Yates who smashed the existing record in June 1980 with a mirror of 51lb 8oz. Most carp anglers still talk about waters that contain the Leney strain as one may discuss a rare pedigree, and rightly so, because that is what this strain of carp was and still is, if you're lucky enough to fish a water that still contains these rare jewels. Documented evidence proves some of these fish lived for an incredible 60+ years, which reminds me of the ancient Japanese Koi strains that can live for generations. To cast my eyes over Donald’s face before embarking on this drawing was both exciting and nerve racking. I knew the name so well but to see it for the first time offered me further insight into this mans life and passion. He has a working mans face, forged from harsh weather, grime and manual labour. This was clearly evident in his large, muscular hands that highlight sinew and strength - certainly not forged from flower arranging! His large broad nose possibly displayed signs of being exposed to the ‘Queensbury Rules’ in his younger years, but equally, I could also see a caring and quieter side to his character through various other photos. This is all very exciting stuff when you have a blank piece of paper in front of you. 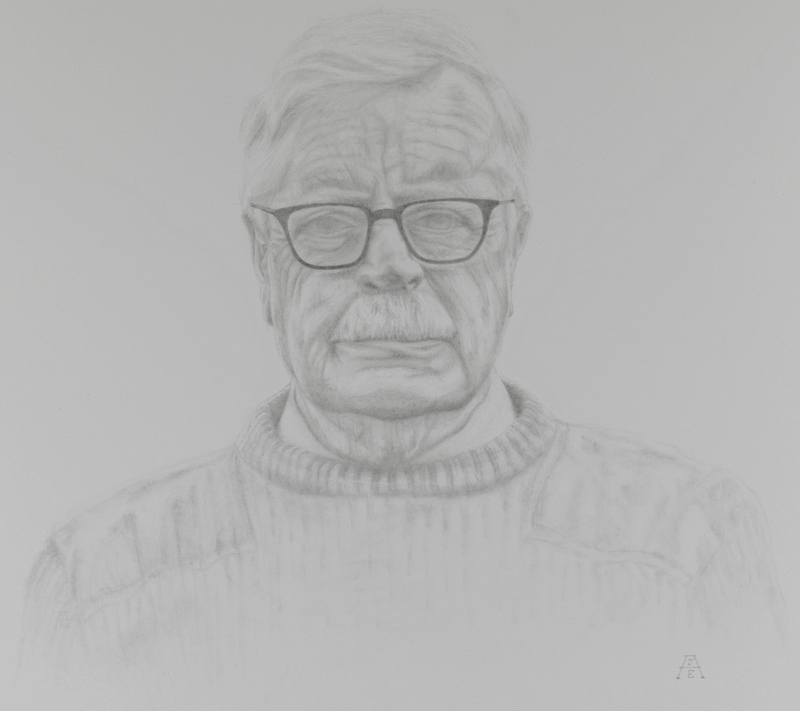 In my humble opinion, this particular drawing, alongside some of the other portrait work I have done for the book, is possibly some of my best work to date. I really wanted to capture the energy of each individual and project to the reader an ethereal ghost like figure that was returning to life, not just some photographic soulless replica. 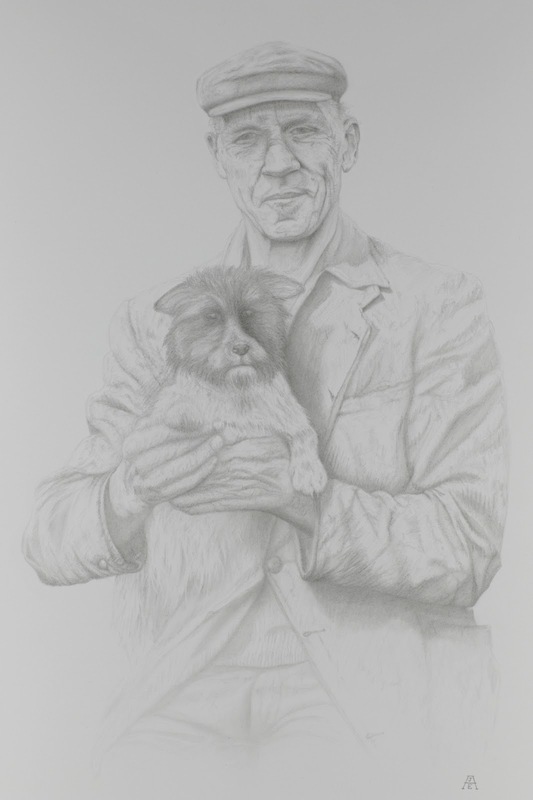 Following Leney was the gifted naturalist, illustrator and author, and one of my favourite country writers ‘Denys James Watkins-Pitchford’, also known under the pseudonym of ‘BB’. The list of acclaims for this man is far too long to list. BB was awarded an MBE and the dozens of books he wrote for both adults and children is really just the tip of the iceberg. ‘Confessions Of A Carp Fisher’ is arguably one of the greats; alongside christening Redmire with its name he was also a wonderful artist. Most famous for his scraperboard book illustrations, he also produced some wonderful paintings. As a passionate naturalist, angler and artist, the powerful words that preface all his books really resonate with me. The beauty and the power. I could write a whole blog about this man alone, but to draw him was more than a privilege and I wonder if I had had the opportunity to meet him in person, whether he would have approved of my portrait? Amongst the collection is a younger Richard Walker who we all know and love as one of the very first pioneers of carp fishing; actually, BB argued he was the first. Like BB, Walker was also a writer but he went on to becoming a household name when in Sept 1952 he broke the British carp record with a 44lb Redmire Pool Common that shook the angling world. Furthermore, he was also designing and producing groundbreaking fishing tackle items. These included the rod that he caught his record carp on, and then went on to breaking Chris Yates’ record using the very same rod at the very same Redmire pool.... uncanny indeed. I think the actual landing net also manufactured by Walker for landing this record carp now resides with Chris Ball...who you will see as you progress through the book is intrinsically tied to all those individuals named herein. I was reluctant to draw Chris Yates, and not from a lack of interest, but I felt everything that could have been written about this man and his record had been done to the point of exhaustion. I really didn't want to go over old ground. He is the godfather; nothing I could write would match what has already been said of the man so I will let his name do the talking. When I had the opportunity to look at all the images for the book, this one of Yates taken in June 1980 holding his record mirror carp of 51lb 8oz stood out, but it was not so apparent at first. We have all seen the famous image a thousand times, but of all the shots in publication, the ones I could recall are of Chris looking square on at the camera with the punt directly behind him in the background. 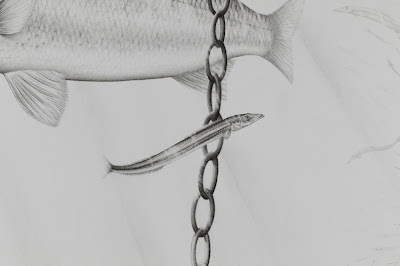 In the image Chris Ball provided, the slight difference was the fact ‘Yates’ was looking down the flank of the fish while fanning the caudal fin with his hand. I felt this added drama, which prompted me to go ahead and draw the image. I am so glad I did because it could arguably be the most iconic carp-fishing photo of our time? A more unknown figure was Tom Mintram who at the time was the syndicate leader of Redmire; a man who had fondly taken Chris Yates under his wing. His face really captivated me with his down-turned puppy dog eyes and cheeks, I could smell the sweet tobacco smoke from his pipe drawing me back to my own grandfather and the recollection of happy bygone times. 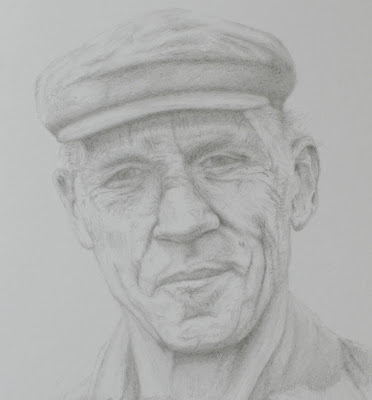 I also managed a small sketch piece of Ritchie McDonald - one of the bad boys of angling in his hey day I hear. I have read a few articles of his adventures over the years, which I found very amusing indeed. 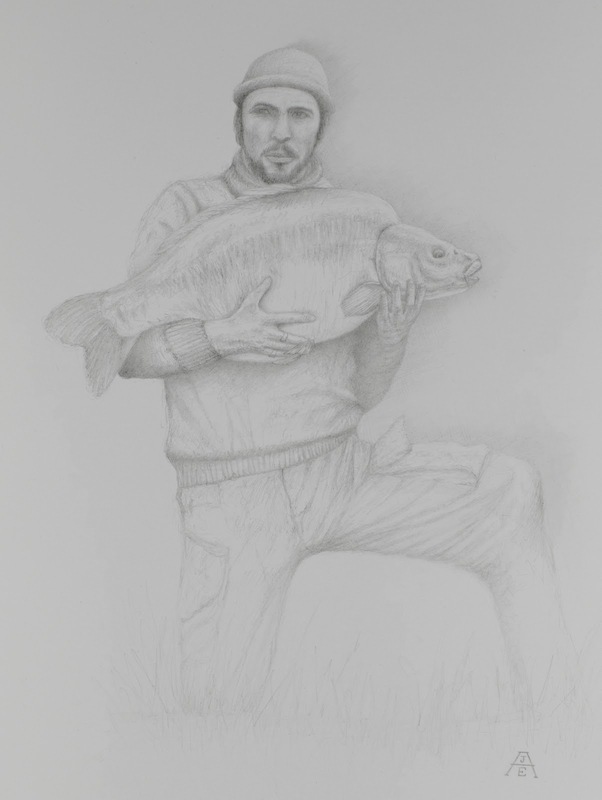 The drawing in question is McDonald holding what was at the time the Ashley Pool record carp, it’s a very special water indeed and one that makes for exciting reading in the book. 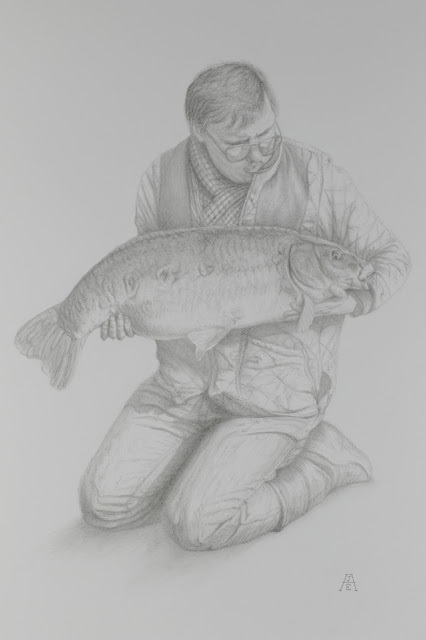 The man himself had to be included, so a drawing of Mr. Ball holding what was a very personal and special carp indeed at the time for many reasons. Not only is the image the last in the collection, it was one I enjoyed very much and it required some time pressure otherwise it could have been a disaster if I hadn't completed it! There are countless other angling greats that I would have loved to draw for the book, but I knew full well time was not on my side this year and maybe some of these other characters will have to wait for another day. All I know is the wealth of images that you will be about to view once the book is available will make your hair curl, real moments in time, frozen in black, white and colour, that trace the winding path of time from past to present. It is all in here and you will no doubt see a few faces looking much younger and fresher than you remember...enjoy. Some of these drawings are now for sale, please remember you are purchasing the original works from the book and no other copies will be available. Most of the main subjects are professional mounted and framed on A3 paper. The drawings are oversized compared to standard book illustration because I wanted them to be stand-alone art pieces in their own right. They are serious works with the most prestigious provenance and set to be collection pieces in the near future. If you require further images of the artwork mounted & framed please feel free to contact. Metallic silver, spines and surf, the European Seabass is a bold predator that evolved to chase down schooling bait fish.... akin to a ‘cackle’ of Hyenas hunting zebra over the African plains. 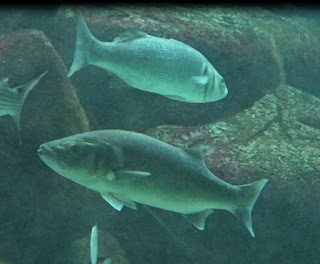 The double dorsal fin of the Seabass reminds me of the freshwater Perch with its dominant leading spine. This, combined with a mouth that has the ability to engulf its prey, enables the bass to consume a multitude species that range from sand eels to crustaceans, and sprats to even its own smaller brethren! It is a slow growing species with 20 or so years required to achieve a double figure specimen. Nonetheless, these old leviathans have the ability to reach 25lb if they can evade the angler’s hook or the trawlerman’s net. The bass is a highly prized sport fish that will strike shore-cast fly’s, plugs and spinners with ease, which makes for very exciting fishing indeed. It can also be caught with bait tactics from a boat, but taking Bass close to a rocky shoreline on a surface popper or fly takes some beating! 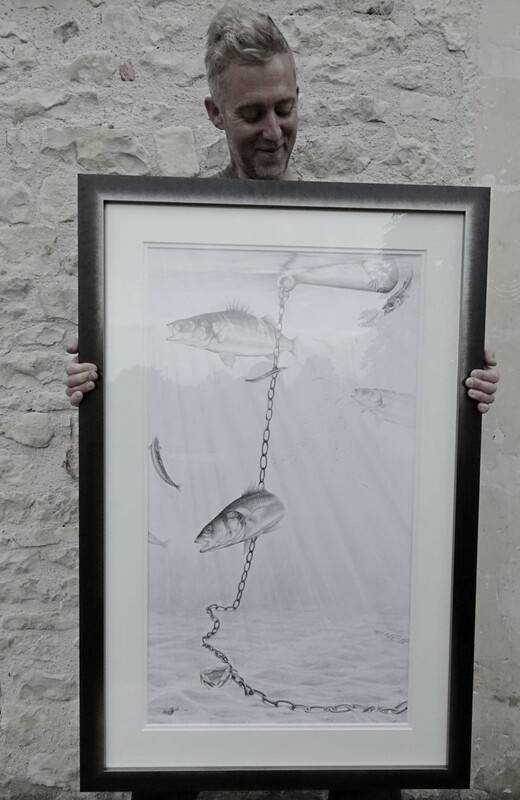 I have been working on this commission for sometime as the customer requested the work in graphite pencil and envisaged a scenario whereby Bass and Mackerel could be observed feeding. With this vision in mind I set about imagining an image of how the composition would look and could be developed. Starting from scratch with no prior reference material, a visit to a huge indoor aquarium was top of my agenda. Next up was acquiring fresh seabass from the fishmonger so that I could study this species up close. Taking these oportunities allowed me to observe the fine details and make sure I would portray the Bass in its true form. I have been keeping and breeding fish for as far back as I can remember, and was also born with a highly contagious angling disability, which I have now had to accept is incurable! 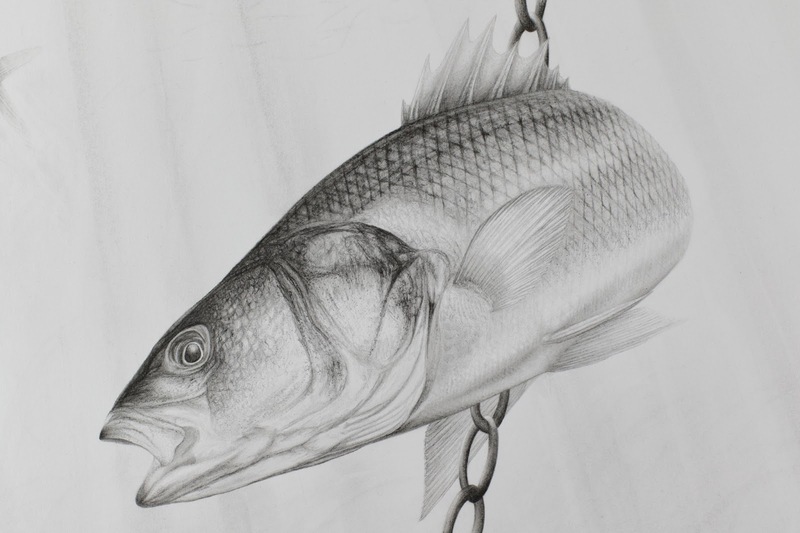 The understanding of fish anatomy, movement and behaviour feels as natural to me as a bee sourcing Pollen, but I will not lie and say the anatomy of the bass was a strong point before this project, as it wasn’t. While on summer holiday with my family, a wonderful opportunity arose whilst out snorkeling off the Brittany coastline with my young Sons. 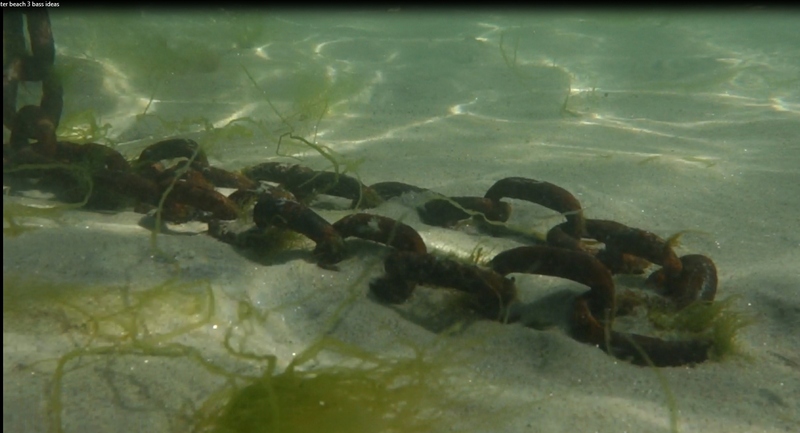 We had been splashing around in the crystal clear waters of a shallow sandy bay leading to the mouth of an estuary. 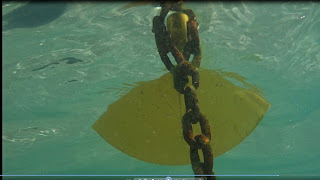 The aim was to capture footage of my boys snorkeling on the underwater camera - well okay, and take the sneaky advantage of grabbing some reference of the light rays dancing over the shallow water seabed. We had been using a row of marker buoys attached to chain links anchored to the seabed as a stop point, when the incoming tide started to build with force. To my amazement a school of young Bass drifted in from the dark distant abyss and were chasing mullet fry around our feet. I can still see those silver flanks flashing past like liquid mercury amongst the dazzling sunrays, and the chain links became the focal feature to this painting before me. It all happened so fast, in fact too fast to capture clear footage, but nonetheless the scene was clearly etched onto my retina and I knew exactly from that moment how I was going to draw the piece. From time to time people ask how did you learn to draw, or how do I start myself? 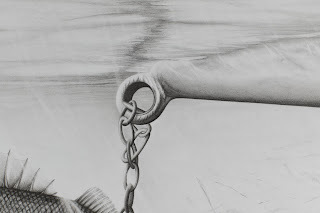 All I can honestly say is that my apprenticeship only started when I commenced with drawing the chain links! 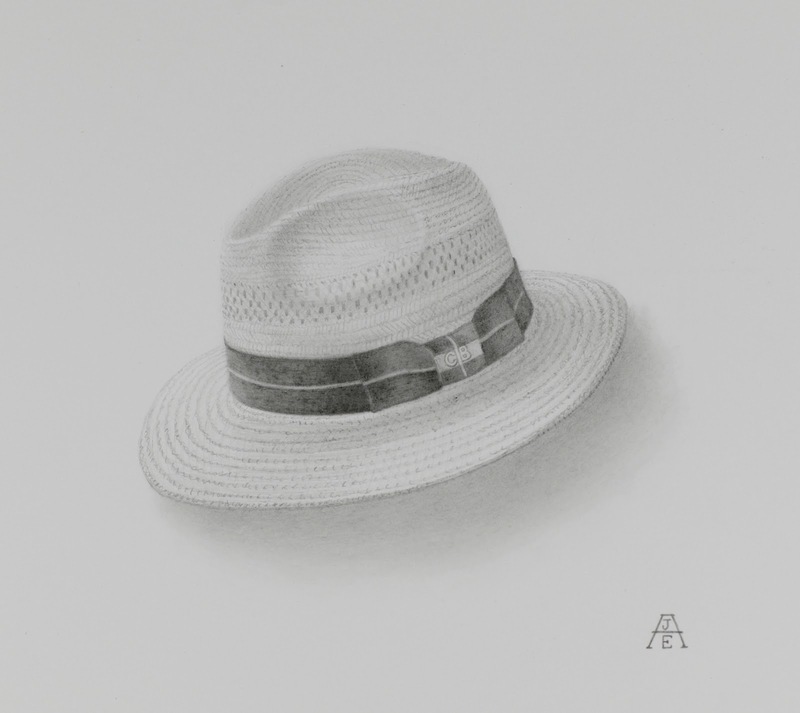 I cannot think of another object so testing with graphite pencil because of the curved nature and no sharp angles. This combined with the play on light as one link is attached to the next, well; it really did test my ability and seemed to take a lifetime to complete. The links increase in size as they come to the foreground, which provides the composition with a sense of depth. In total there are 73 links spanning nearly a metre in length, and this for me was a huge undertaking. 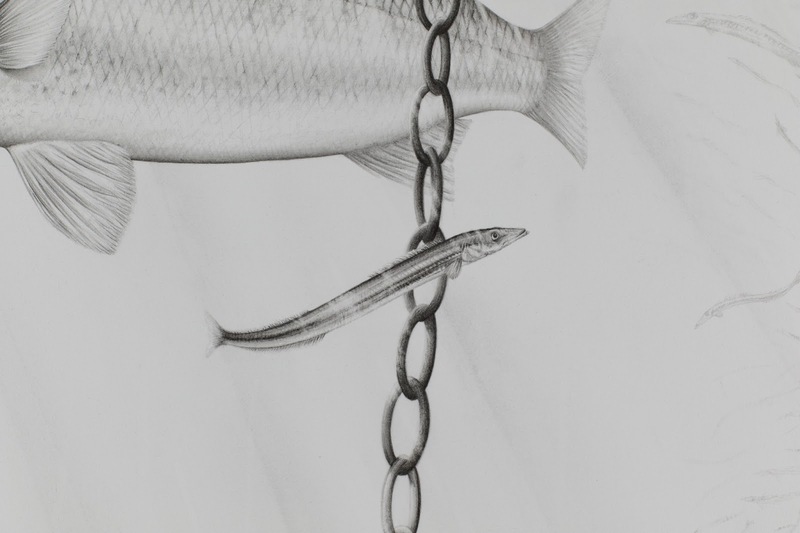 In all honesty, the fish drawings flowed relatively easy in comparison to the links. I'm not sure you can appreciate the full impact of the drawing via the images below because so much emphasis is placed on the delicate light rays that pass through the piece. Combine the light bouncing off all objects within the drawing and it results in a piece of work that really does need to be viewed in the flesh to fully appreciate the feeling it invokes. I felt quite pleased with this piece once framed in its large pewter type frame and bold mount. It is my largest piece to date and one that has taught me so much for my future work. I really hope any bass anglers out there feel I have done this fish justice. It truly is a bold and very special fish that is coming under increasing threat from trawler fishing around the UK coastal waters. 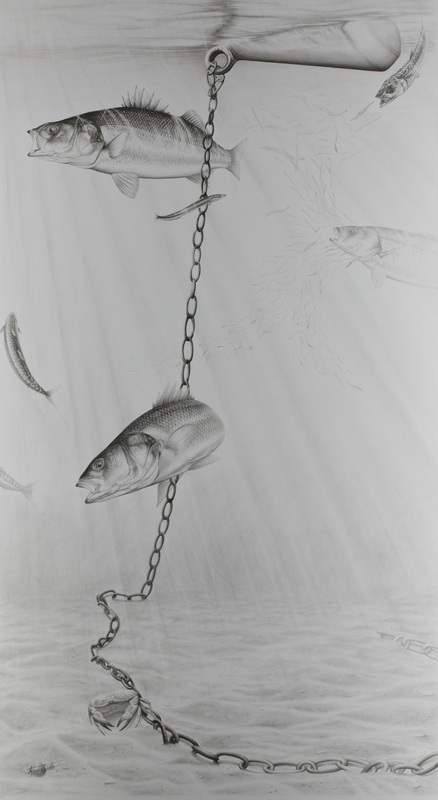 Once again it is anglers that seem to lead the protection fight, as taking care of this species is vital to save future stocks from plummeting. Many of you may not have heard about an interesting event that took place in mid-summer. It was held at the beautiful location of Bolton Castle in Wensleydale, Yorkshire. 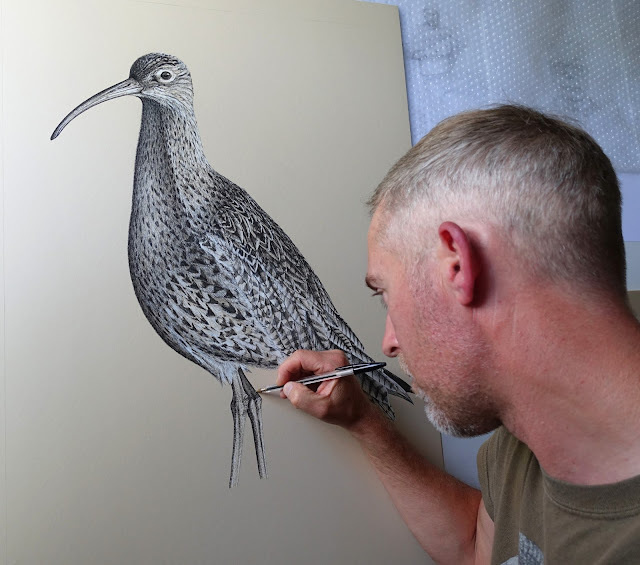 The whole project started out as an awareness building exercise to highlight the plight of the curlew, an iconic wader who’s numbers have been dropping at an alarming rate. In both the UK and Ireland birds have declined by ~90% in some locations, which clearly indicate something is drastically amiss from an environmental perspective. 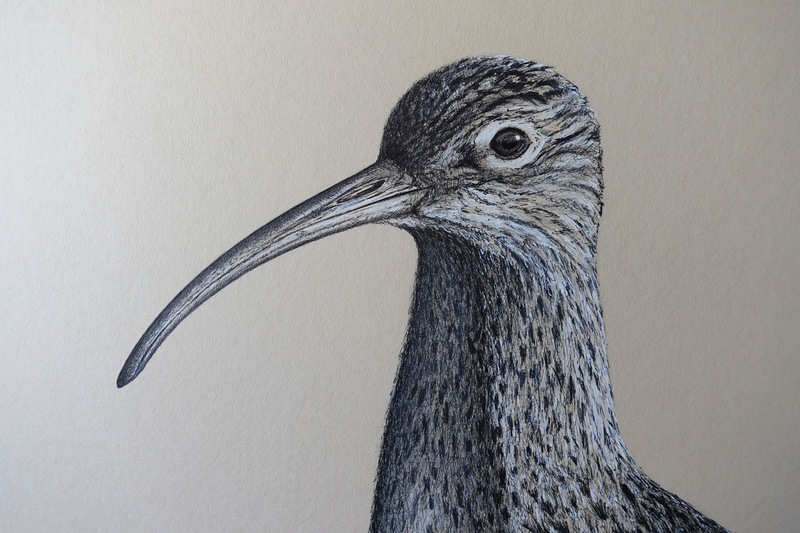 Without constructive action the curlew’s distinctive moorland song will become a historic moorland (and coastal) relic, and a song that would be gravely missed by many if this outcome were to manifest. The event was a gathering of likeminded individuals ranging from the RSPB to Wader Quest, BTO and the Game & Wildlife Trust, along with experts and naturalists from the general public, all wanting to get involved and help in some small way. This event rolled on from Mary Colwell's charity walk that saw this passionate lady walk over 500 miles to raise awareness of this enigmatic bird. I donated three small sketches to this cause last year, which subsequently raised over £350 pounds (this topic is covered in one of my earlier blog's). Unfortunately I could not attend this summer event in person due to short notice and other commitments, but in my absence I put together this larger than life ink drawing of an adult female curlew to provide a focal feature for the event, and add some colour and a visual element to the weekend. 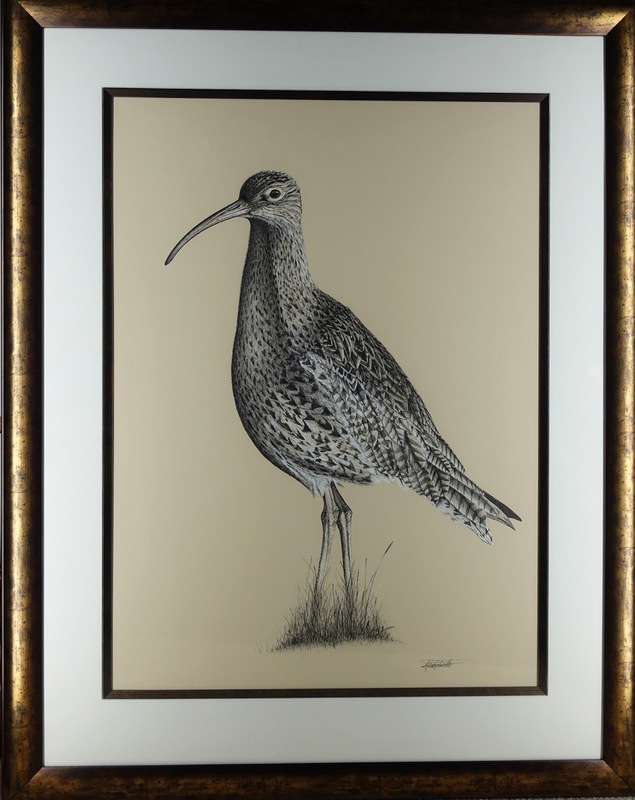 The piece of artwork I have for sale is a very large ink drawing of a wonderful female curlew in a characteristic bold upright pose on toned artboard. I wanted it to be a large focal feature for the event, and appeal to others who have an affinity with one of the UKs most majestic waders. The complete piece is professionally mounted and the drawing size is 640 x 480 mm, with external frame dimensions at 1060 x 850 mm. We have all had that feeling when we are being watched, where the hairs on your neck tell you something sinister is lurking amongst the shadows. It is a sense that serves us well and evolved for good reason – predation. Predators such as the Goshawk not only bring balance to the food chain, they also breathe fear into an environment. There is a German saying that you know the goshawk is there ‘because you don’t see it’. An arboreal jaguar, the Goshawk is as adept at striking fur as feather and a perfect example of a calculating opportunist. Bang…this bird hits like a hammer and has the skill and nerve to match its lust for killing. It has a wide range in culinary tastes that enable it to take mammals as large as hares (the female Gos is much bigger than the male, so this is gender dependant) to rabbits and squirrels. 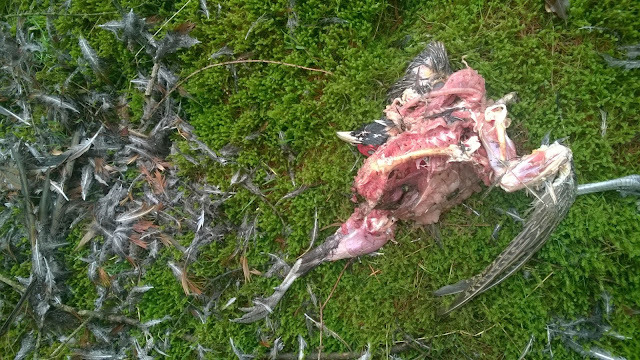 Feathered quarry range from pheasant and wood pigeon, to corvids and crossbill (yes, I once found the remains on a nest site plucking post) and everything in between. For such a bold apex predator, very few people have ever seen one. Countrymen with serious knowledge and experience rarely get more than a glimpse if they are lucky, and that includes having the field-craft to even know where its home range lies. Its an apparition, a flash of barred steel grey, an ephemeral glimpse, even then your brain has to try and process the data to comprehend it was what you thought it was, or maybe just a dream-like fantasy where you convinced yourself it could have been a Goshawk? It’s like a Sparrowhawk on steroids - very similar in design but so much larger and bulkier. 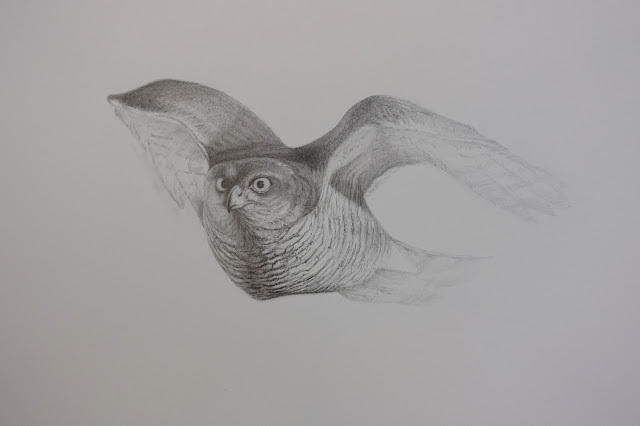 In contrast to the Spar, the Goshawk in flight has a much deeper chest, rounded tail and more conspicuous head and neck. A true Olympian of the hawking world and if you were to put both the Gos and Spar on the podium, it would be like the clash of the titans between Schwarzenegger and Franco Columbu in their heyday! Certain species evolved over millennia for one purpose only and that's to kill for survival. Predators play a vital balance in the eco-system, and while many people cannot relate to the bloodlust of certain creatures, I have always been fascinated by their intelligence and ability to survive. I have noticed through observation over many years that most predators are more intelligent than herbivores. This is not a given with some of the largest primates like gorillas and orang-utans being highly intelligent, but on the whole it seems to be the case. Regarding food, if you think about most herbivores' requirements, they have not had to develop the skillset to outwit their chlorophyll prey (granted though, they must evade capture). Vegetation grazing at ground level or any other kind of plant matter is a simple process not requiring wit, cunning or premeditative tactics to meet your daily nutritional needs. On the other hand a predator has to make calculated judgements every time it wants to feed, with no two scenarios the same it takes a highly intelligent creature to perform this task each feeding time. 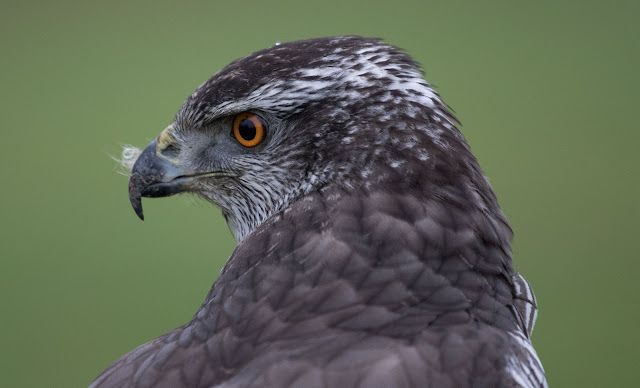 Oftentimes, predators such as the Goshawk have no more than a few milliseconds to make an adjustment to achieve success (or failure) resulting in the greatest price for its prey - death. The fear it brings to its environment can also be a good thing as it keeps clever egg and nestling opportunists such as magpies and crows on the move and looking over their shoulders. It is interesting that small birds such as the Goldcrest have been documented breeding extremely close to Goshawk nests due to the protection they afford from such opportunists – obviously they are too small a meal! The Goshawk embodies all the attributes of an excocet missile and to watch one flash through a woodland glade, ride or boundary edge is nothing short of hair-raising. In fact its turn of speed through close wooded quarters can appear to defy physics. To try and depict this bird in any other way would be an injustice and a complete lack of understanding on my part, it’s like the velociraptor of the bird world...in fact mention the word ‘Goshawk’ to anyone in the know and their response would say it all I guess! If one bird were solely designed for killing its victim with precision and lack of empathy, the Goshawk would be close to pole position. As a sprinter its short broad wings and long tail aid acceleration, pursuit and manoeuvrability in both deciduous and coniferous forest. Combine these attributes with stout legs and extremely powerful talons and you have the recipe for a bird designed for ambush tactics using speed and skill to bring down prey with a very high success rate. I have been more than lucky in my time to witness wild hunting and nesting Goshawks, but on most occasions, nothing more than a ghostly flash. I even have footage of a first year bird with its prey on the ground, along with other close encounters I have witnessed, which have left long lasting memories. The piece I have put together is 740mm x 340mm (drawing Size)on grey-toned art-board, with mix media consisting of ink pen, graphite and white chalk. 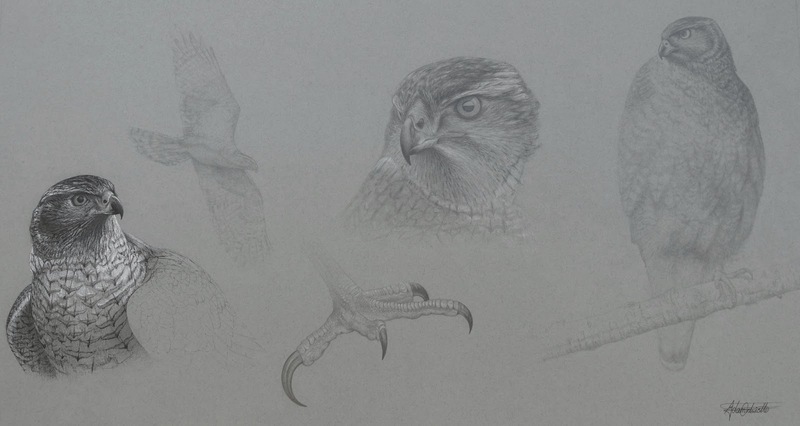 I wanted to try and capture elements of the Goshawks energy, from the glazed look of a serial killer, to the ghostly outline passing through a woodland glade, along with powerful talons that show the sheer power this hawk possesses in that pounce of sinew, bone and hook. The piece is for sale professional mounted and framed. The last drawing for sale is a Peregrine study, once again on A3 paper (Drawing Size 330mm x 290mm) and this time something a little different with an internal border added to the paper - it’s something I have been playing around with and you will be seeing more of this feature incorporated into future pieces. 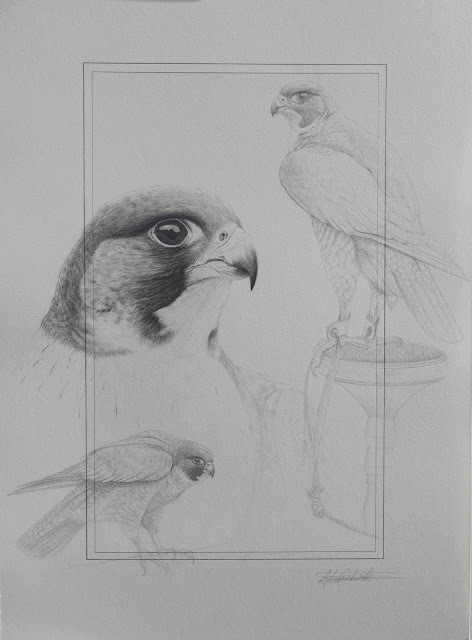 The reference for this drawing was gathered from a wild peregrine that had been injured, which allowed me to spend a day with the bird just before she was released. 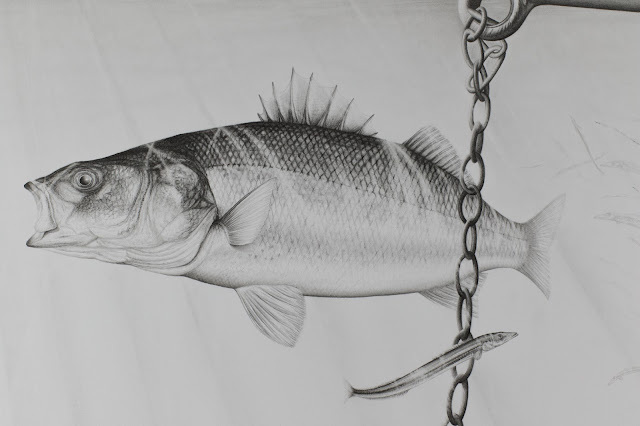 I hope you enjoy my latest works focused around birds of prey, but once again a big jump on the board over the last month and I'm back drawing fish and fishing related subjects! PLEASE REMEMBER TO CLICK ON THE IMAGES TO VIEW A LARGER IMAGE, GIVING A BETTER PERSPECTIVE OF THE ORIGINAL PIECE. When I think of my time spent wandering the river bank, a bird that first springs to mind is the Kingfisher. No other bird is more synonymous with angling, and no other angler is more consistent at catching fish than one of my favourite waterside birds. When you get the wonderful opportunity to view this beautiful bird at close quarters, it is like Mother Nature went overboard with the colour palette, such bold and striking colours. Combine those colours with late evening sunlight and it is hard to describe in written words the brilliance of that electric blue central stripe cresting the length of its back from mantle to tail - nature at its most beautiful. Over time I have become accustomed to the high pitched single note that announces the Kingfisher’s presence. Often produced in flight and lasting less than a few milliseconds, each note precedes that iridescent flash. With just enough time for the call to register, you pause and look up from the float as he powers past with conviction. Banking hard to one side like a fighter jet, he twists and turns following the contour of the land, all the while tracking the stream like a rally driver co-pilot using an ordnance survey map. After what can only be described as a moment in time, you refocus back on the stick float which is no longer present, only to bump the fish due to not striking the hook home....Arrrrrrr! 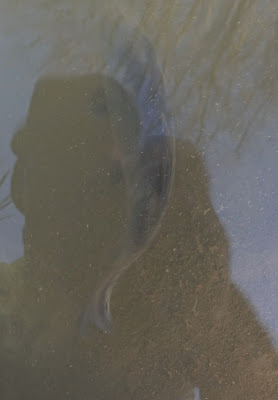 I never have worked out how that happens, or coincides with turning to your rucksack for a flask or sandwiches only to miss that single bite of the day....I'm sure these fish are watching us. 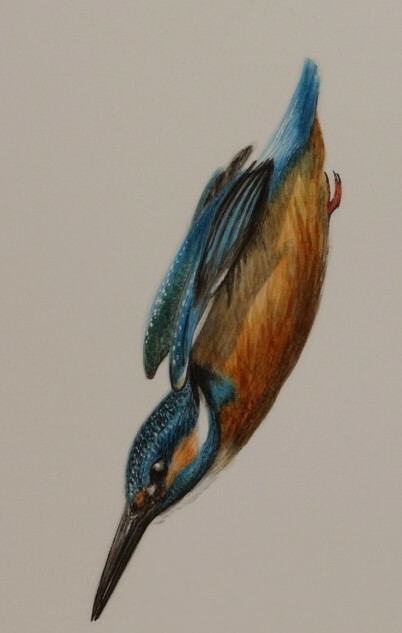 Towards the end of last year I started working in watercolour and thought the Kingfisher being so bold & beautiful would provide the perfect range of colours for which to try my hand. To be honest, I found it quite instinctive and soon got to grips with controlling a brush instead of my usual pencil - the difference in speed is staggering and much more fluid. I soon realised that mastering a pencil is far more demanding and painstakingly slow compared to working in watercolour. Nonetheless, graphite develops essential skills and is equally rewarding. I haven't worked in oil yet, but I have been building up to that moment and will start this year, so keep tuned for a change in my future works. 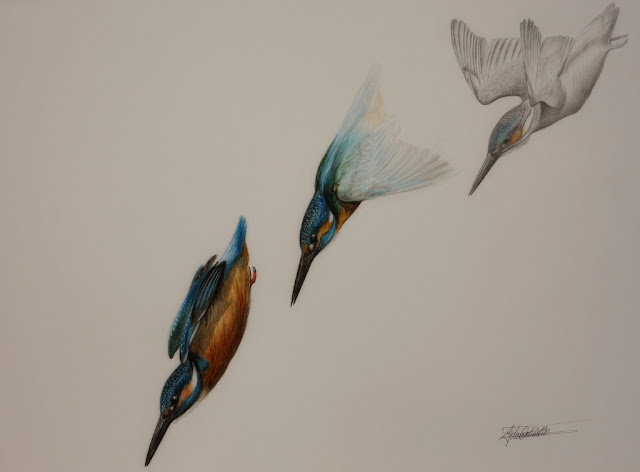 Instead of a static pose, I wanted to express the Kingfisher’s motion in watercolours; this resulted in a 3-stage piece blending from graphite pencil into partial colour, with the final bird presented in full colour. Maybe this was a transition stage in my mind from pencil to paint, either way I was really pleased with the resulting effect, which is something I do not say very often. 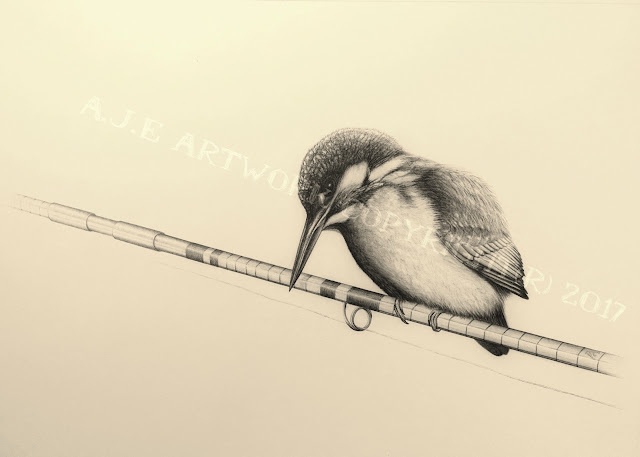 After a couple of recent attempts in watercolour, I swung back to graphite pencil for my latest piece, a Kingfisher on an anglers rod tip...why would it be anything else! I had chosen a lovely old cane rod to maintain a traditional feel to the piece. Using strong side light, I could add a nice dark shadow to the underside of the bird to produce maximum depth. 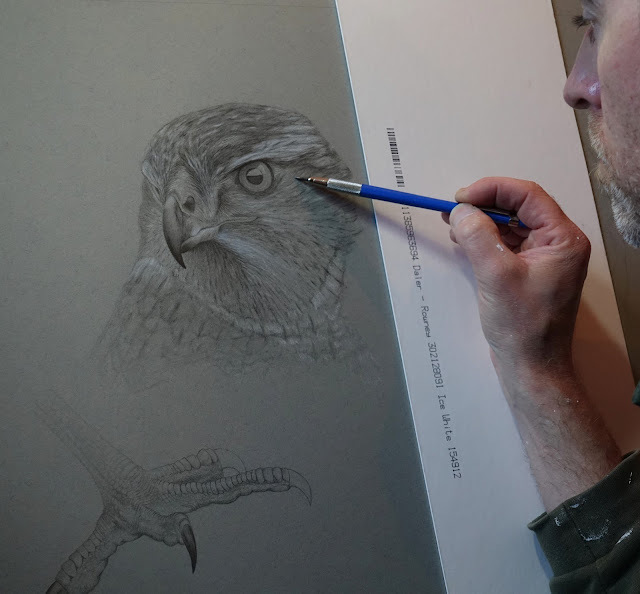 It is not an easy subject to depict in graphite because your mind subconsciously links this bird to colour, so it was important for me to try and achieve a large tonal range to provide the illusion of colour. It has been some time since I last posted on my Art blog. This is not to say I haven't been busy, in fact just the opposite, but this is my first blog for 2017 and tailored for the angler rather than artist. It’s a post I have wanted to put together for a while and the perfect situation had arisen over the course of the winter. I have to harvest fish stocks every two years from our fishery business and I have seen numerous examples of what I'm about to explain. However, I never managed to gather any photographic evidence to prove it so when I have recounted the story to fellow anglers in the past, I have noticed a look of disbelief and sniggering, whilst all the while I try to convince them it’s the truth and not another ‘old wives’ tale’. 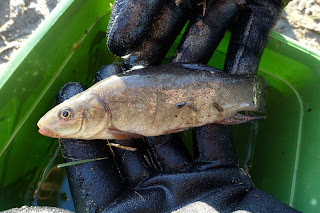 Of all the fresh water fish I have had to deal with over the years nothing can compare to the Tench for being the toughest of all.....it’s almost indestructible! If you can imagine, when you drain a lake you are left with lots of little puddles of water on the lake bed and these frequently contain very small fish, anything from roach to perch fry, along with tench and the odd small jack pike. Most of these fish will not survive more than a few hours and that's if they can evade the Heron & Egrets capitalising on the easy free meal. In the past I have observed Marsh harrier working the lake beds, along with night raids from Boar, Fox & even Pine Marten. Once the bulk of the fish have been removed a team of men will then work the remainder of the lake bed in a grid fashion just to make sure nothing has been missed. Unfortunately with fingerling size fish it’s almost impossible to save them all and I justify this by the bird life capitalising on the free meal over the harsh winter period so nothing is lost or wasted....which is always the case with the natural environment. One year all the tench had been harvested and graded into large tanks that are loaded onto a pickup ready to be transported. This particular evening the weather had been cruel and the fish dealer arrived late, so we worked into dark with hands the colour of blue steel and core body temperatures that felt like the inside of a chest freezer. With the job complete, we retired for the evening, cold and wet and tired. 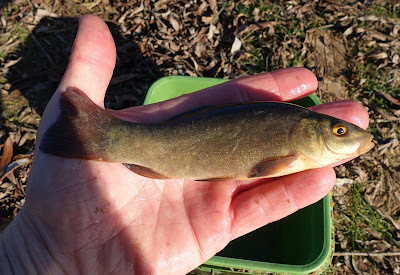 The following morning we awoke to -4oC and a hard frost carpeting the outside world.....after slipping back into the frozen waders and preparing for the daily events, I noticed a small tench no longer than 4" long frozen to the pickup bed. It was frozen solid to the steel and I could not prise it off. 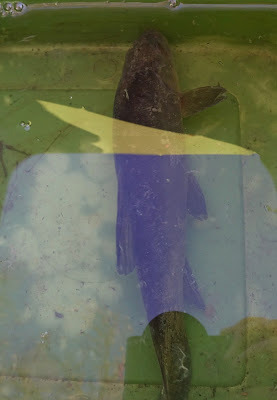 As I stopped and took a close look, pitying my mistake, I thought its eye moved slightly within its socket.....it cannot be I thought, so I gathered a bucket of water and poured it over the fish to defrost it off the steel floor. After quickly transferring into a bucket of water, within 10 minutes that fish was swimming around. Now I know that's hard to believe because that fish had spent a minimum of 12 hours out of water and was then frozen solid in -4 oC temps and it still survived! Unbelievable and just goes to show when a lake freezes in winter and the fish bed down into the soft silt to enter a dormant state, they have little to worry about compared to that poor chap. This winter a similar scenario happened, only this time a small tench was missed underneath the weighing scales when fish had to be graded and weighed. You might think ‘how careless’ but when you are talking of 1000s of fish that require grading it’s very easy to lose or miss something as long as your hand. 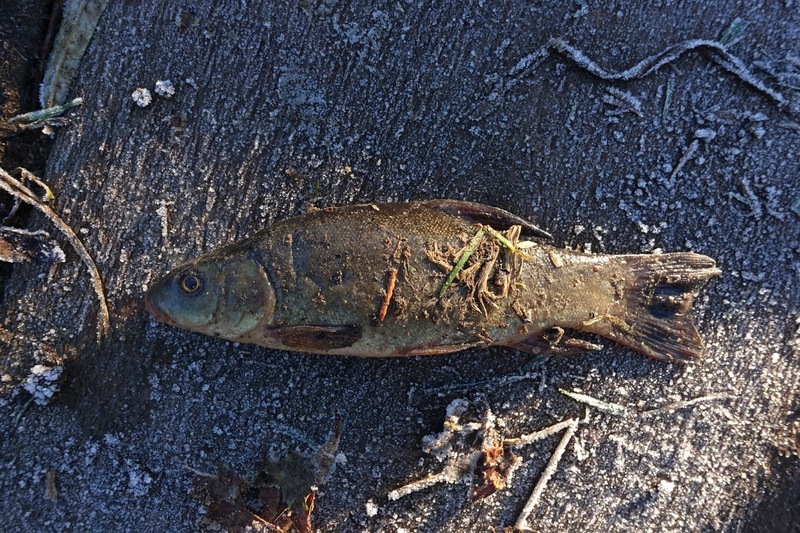 Nevertheless, this little tench lay there all night frozen to the trailer which I inadvertently stumbled across in the morning when the steel scales were moved - as can be seen in the first picture with the grass and mud frozen to his flanks. Once again his little red eye swivelled in its socket, I placed him into the bucket to defrost, washed his flanks to remove the frozen debris and as can be seen from the series of pictures you can see how miraculously it comes alive and swims away to fight another day. Now if that's not one of nature’s miracles! This is a story I really wanted to share, it doesn't tie in with my artwork very well but gives you a little insight into my working life outside of art. It is a small indication of how the natural world can still leave me speechless after all these years. 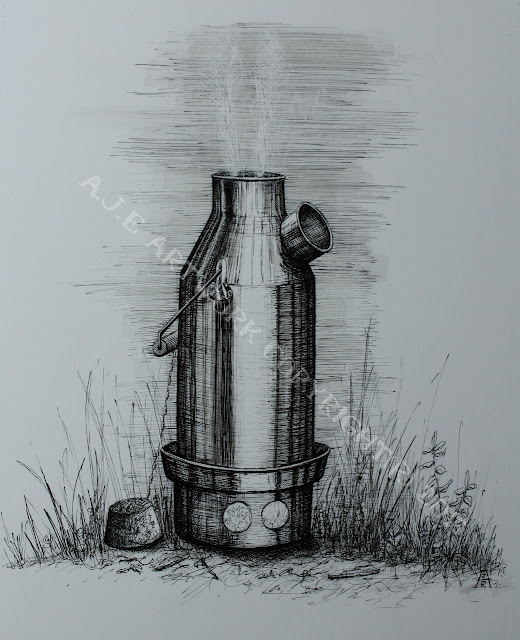 I have drawn the tench on numerous occasions; my last attempt was in a　different medium using Ink on scraper board for the illustrations in the wonderful book ‘A Coming of Age’ by Stuart Harris, a gifted writer and angler. 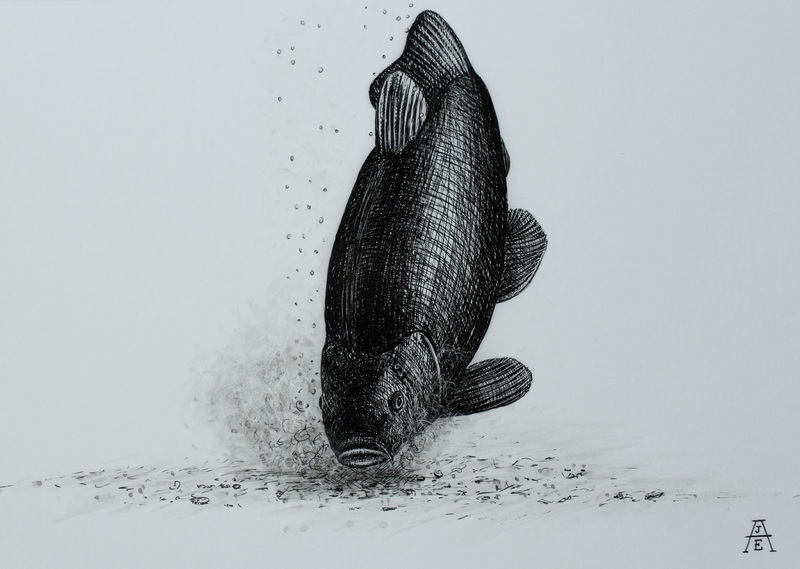 I'm afraid this drawing is now sold along with my other tench works, but I'm sure it won’t be the last one　now I know the magical powers this fish possesses. I hope you enjoyed the story; my next blog is linked to water but this time a little more colourful! I have been quietly working away on a lovely project for an angling book that is now ready to be published in the next month and available on pre order now. It is available from ‘The Little Egret Press’, which is a small bespoke angling publication company that specialises in limited edition books and exquisite leather bindings! It has been anything but work and something I feel grateful to have been involved with, enjoying every minute reading each enchanting chapter, and trying to link my artwork with the wonderful written words. The aim has been to ensure the reader gains a visual connection throughout the book, which I feel, is an important link. You may not have not heard of Stu who carries the pseudonym ‘The Sweetcorn Kid’; his real name is Stuart Harris and this is his second book. Stu’s first book is ‘From Carbon to Cane’ and it’s a fantastic read in itself, highlighting that angling enjoyment can be found by returning to basics, in other words, leaving the mountain of modern day tackle behind! The book reveals that angling is so much more than just catching fish - for Stu it was a pilgrimage that led to reverting back to tackle used more than 50 years ago, and through this journey, becoming the angler he is today. 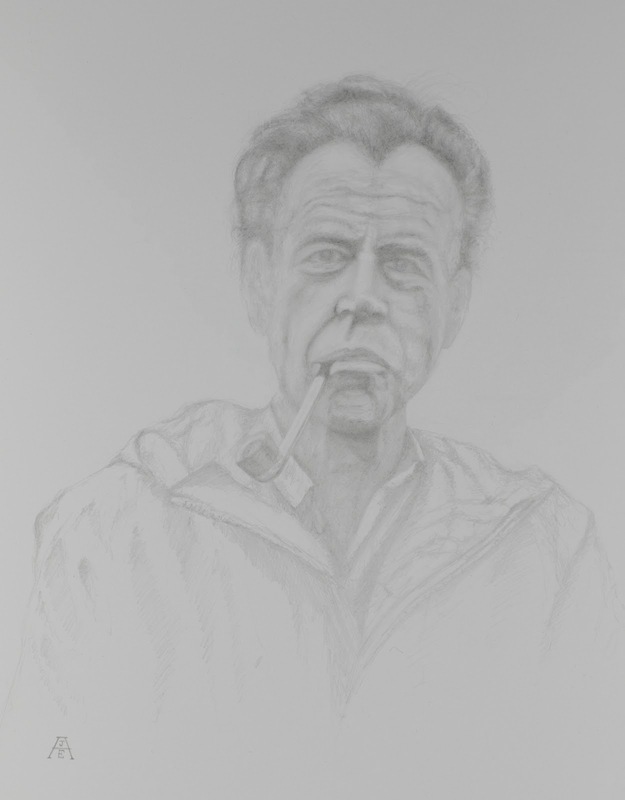 His second publication ‘A Coming of Age’ is based on a full season diary of events, fishing all manner of venues from the Legendary Redmire Pool, to far more discreet venues that in some ways are even more mysterious and exciting than Redmire itself. Stu is a very accomplished all-round angler, more than happy fishing the pin and cane for monstrous Gudgeon, chasing dark, scaly shadows that inhabit ‘The Moat’, or summer days float fishing for the most ancient of Crucian Carp, winter Grayling and spring Tench....the list goes on! For better and worse, angling has changed significantly over the last 10 years and it's becoming increasingly more difficult to find natural venues, unspoilt by the passage of human feet and interference...hence the inspiration for this book....and like the ‘Chronicles of Narnia’ it contains tales that take you on an enchanting journey into another world. You flit from one venue to the next and become immersed in the underwater world of angling, along with wildlife that most anglers have the privilege to enjoy whilst spending time on the bank side. Rest assured, this is not just another glory book of ‘look at me holding another lake record’ influenced by nothing more than lbs, ounces and self-gratification. For those who know me, my time is limited through various commitments, therefore it is imperative I enjoy my art and for those reasons I have stopped taking on commissions of subjects I don't connect with. I believe this is quite a natural progression for many artists, and fortunately I don't have to pay the mortgage from my work, so without this pressure I have the freedom to enjoy what I do. This year I have been asked to illustrate for a number of books, but getting involved with ‘The Sweetcorn Kid’ was something I dearly wanted to do. It's all about the passion for me and that's what is evident about Stu and his angling...beaming smiles with every shot, enthusiasm for his venues and tackle, appreciating all fish regardless of size and stopping to marvel at the flora and fauna along the way. That's the essence of angling right there and it’s why I have always been a lifelong fishing addict. For too many anglers these days it's a job....and nothing is more obvious than a deadpan look while holding another carp like it's another day at the office......well deal-me-out and ‘stop this ride because I'm getting off’. The day the passion is dead I'm taking up golf! I won't go into any more detail regarding the book and I don't do cheap plugs....but if like myself, your passion is for the things I have mentioned above, then go buy yourself a copy. Along with Stu's great storytelling, he has this inherent ability to capture an image with the camera....I have other friends who are gifted at taking pictures and it's purely a natural skill....you either have it or not! With every turn of the page you will be spellbound by the images which complement this book greatly. Beautifully written words enhance the visual element of the images and art, enabling you to break through the meniscus into angling heaven, and this is where my part is played in this wonderful book. Stu requested at the beginning that the 22 chapters were to be accompanied with a drawing....treading carefully with his words knowing it was a huge undertaking for myself, and not wanting to be cheeky, well let's just say that the final count amassed 45 drawings (the fact he has a grip like Giant Haystack's had nothing to do with it, honest). It was important for me that the illustrations connected with each chapter, not just a random image with no meaning. I started by reading each chapter and when images jumped from Stu’s writing into my imagination, I would scribble down ideas and combine these with input from the man himself. Eventually, after bashing ideas back and forth, we managed to come up with the chosen drawings. Stu was very keen on the idea of ink drawings, preferring black and white images over graphite pencil or colour, and also being heavily influenced by some of the past great angling books and his own hero's! With this in mind I wanted to try a new technique and use ink on white scraper board, i.e. the one used by "BB" himself, and another of my favourite artists Charles Tunnicliffe. The surface is not paper but card with a very thin coating of china clay applied to the surface. This allowed me to both illustrate in ink pen and apply ink washes with a brush to the surface, but the magic is created by scratching the surface with a sharp implement to remove specific areas of ink and reveal the white under layer. Whilst this is not so obvious to many (thinking it's just ink on paper) it allowed me to develop very fine detail in areas that can add a third dimension to the work. Even though it's a very old technique that some of the great illustrators have used extensively in the past, I very much wanted to add my own style after finding some of the older works a little one dimensional in some cases. Hopefully you will enjoy what I have put together and if it encompasses Stu's written words and enriches the book, well then I have played my part well! 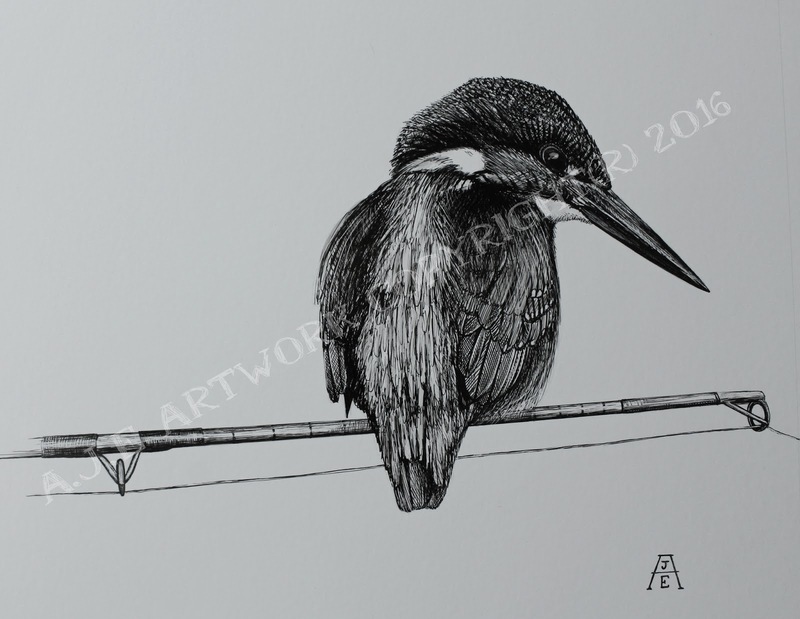 Most of the works will be available to buy, I will add a few to this blog to give you an insight of the pieces, but in the meantime if you have any questions please feel free to contact me via the blog email or from my Facebook Art page ( Adam Entwistle British Wildlife & Angling Artist). All works are ink on A4 White scraper board; they will be double mounted along with backing board ready for framing. Priced on average at £120 each, with some of the more detailed works £150 and smaller pieces £90. Each piece is totally unique, with no prints or reproductions available they will become small collection pieces in the future and hopefully grow in value. My life long vice has always been water, whether it's a draw on a molecular level or maybe I was a Water Vole in another life, I'm not sure. Throughout my childhood I was never far from H20 be it fishing or breaking through the meniscus to ponder at the aquatic underworld, either way these fond memories have left a profound mark on my life. Other than being an obsessive naturalist, angling has always been my one true love . From the first time I wet a line, catching a upland Wild Brown Trout, to summer holidays spent fishing amongst the lily pads trying to outwit Estate lake Tench, endless summer days of chasing dreams & shadows, push bikes at the ready and the alarm clock signalling dawn break, I could not think of a more fulfilling life if I had my time again. This early seed grew into a towering Oak and I still chase these dreams & shadows today ,& the flame still burns bright. Angling is the perfect symbiosis with nature & the ideal pastime to observe Flora & Fauna, undisturbed, unadulterated & at close quarters.